Mandated by state law, the report is a useful and detailed resource for early education providers and advocates as well as legislators who want to know more about EEC’s goals and operations. 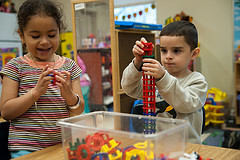 Created in 2005, EEC is the first “early education and care-focused department of its kind in the nation,” as the report explains. It combines parts of the former Department of Education (now the Department of Elementary and Secondary Education) and parts of the Executive Office of Health and Human Services. – “Create a workforce system that maintains worker diversity,” provides professional support, and produces strong outcomes for children. – “Build the internal infrastructure” required to achieve this vision. The Income Eligible waitlist maintained by EEC is currently at 40,518 children birth-to-school age, including more than 24,000 infants, toddlers and preschool-age children. Appendix D of the report features data tables that break down the waitlist by age for each month of 2013, as well as by the ten “ESE Commissioner’s District” cities, and by priority code (i.e. foster care, homeless family, special needs). To learn more, download the report, which is available here.